“It is obvious to me that within 6 months there will only be two kinds of apps for the iPhone: Twitter clients and novelty fart apps.” So wrote Scott McNulty on Twitter, and it’s not hard to see why. Twitter apps are to the iPhone today what new AfterDark screensavers were to the Mac in the early ’90s: It’s impossible to keep track of them all, and there’s a considerable range in quality. I spent some time composing and reading 140-character missives with five popular Twitter apps. Here’s how they stack up. Take Action: Twitterrific’s smart actions palette gives you quick access to several tasks—replying, retweeting, and more. 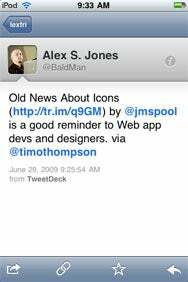 The Iconfactory’s Twitterrific, available in a $4 premium version and a free, ad-supported variant, was one of the first Twitter apps available for iPhone. Ads are the only difference between the two versions, and they’re entirely inoffensive in the free app. Of all the apps I tested, Twitterrific offers my favorite “compose” screen when replying to other tweets: As you craft your message, you can toggle between making it a public reply, a direct message, or a regular ol’ tweet. Another clever composing feature (though, as we’ll see, not unique) is tweet compression: Twitterrific can smartly shorten certain words (like “with” to “w/”, or “Saturday” to “Sat”)… without making you look like a tween texter. (“I want 2 c u!”) Twitterrific employs a smart actions palette with quick access to replying, retweeting, seeing the author’s profile, or even accessing a link within the tweet to save (to Instapaper) or tweet about. Twitterrific’s author view lets you scroll through that user’s favorites; of all the apps in this round-up, Twitterrific is the only one besides Twittelator Pro to offer that clever feature. I love that I’m able to create “tapping” shortcuts (like double-tapping on a tweet to see the threaded conversation), though I wish I could create one that triggered a reply. My only other major complaint about Twitterrific is that it stutters while scrolling. Tweetie’s scrolling, on the other hand, is the Twitter client equivalent of I Can’t Believe It’s Not Butter—it’s the smoothest scroller of all the Twitter apps I tried. The $3 app from atebits does seem to load avatars a beat slower than its competition, even on Wi-Fi, but that’s a small annoyance. Tweetie Time: Tweetie scoes points for its overall elegance. Like Twitterrific, Tweetie features great handling of links within tweets, including the ability to add to Instapaper or retweet the link. Tweetie also makes it extremely simple to post replies, retweets of the entire tweet, or even a link to the tweet in question. Tweetie’s multiple account support is best in class, including the well-implemented ability to change which account you’re posting from as you write a tweet. Tweetie rivals Twitterrific for overall app elegance, and scores a bit higher with me because its interface feels a smidge more intuitive: I had to learn to reply with Twitterrific, and just figured it out with Tweetie. Take Time to Tweet: Whether its the free or paid version, TwitterFon takes a little time to learn, as you need to remember to tap on an avatar to reply to a tweet. naan studio’s offerings include free and pro versions of TwitterFon. The $5 pro version adds multiple account support, multicolored themes, a landscape keyboard, the oft-duplicated Instapaper integration, and no advertising. TwitterFon’s interface takes time to learn: You tap on the avatar to reply to a tweet, or tap on the tweet itself to bring up a screen with reply, direct message, or retweet buttons. TwitterFon Pro’s smartest feature is the ability to use separate themes for different accounts, which can be useful in making sure your brain notes “where you are” as you read and reply. While TwitterFon caches old tweets to stay snappier (and it works), it lacks the ability to keep fetching older tweets—a frustrating omission when you’ve been off the grid for hours and want to catch up on everything you missed. The app’s also missing an easy way to grab a link from one tweet to put in a new post of your own. Scrolling is smoother than Twitterrific, but does get the jitters while accessing the network. While the Pro version is decent, the free version of TwitterFon is too crippled to complete with the free version of Twitterrific. 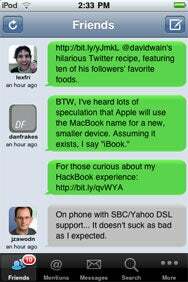 On The Bubble: SimplyTweet displays your friends’ tweets in a speech bubble format. SimplyTweet, $4 or free for the lite version, is MotionObj’s Twitter contribution. Its appearance lives up to its name: The app looks pretty barebones. Only the paid version of SimplyTweet gets saved views (“groups” of friends), saved notes, multiple accounts, profile editing, access to the public Twitter timeline, photo search, and Twitterrific-esque tweet shrinking. I don’t love SimplyTweet’s speech bubble look. Unlike every other app I looked at, SimplyTweet doesn’t highlight your own tweets, which is a silly oversight. It’s also the only one not to offer different visual themes. Multiple account support is poor—you must click on the More tab, then Accounts, then click on the desired account, then tap Use This Account, then wait a moment while it’s loading, and finally tap back on the Friends tab to switch timelines. Boo. If you want to save links for later—you guessed it, SimplyTweet integrates with Instapaper. SimplyTweet’s shortener, unlike Twitterrific’s, does get a l’il 2 txty 4 my tastes. The lite version, like Twitterfon’s free version, really can’t stand up to Twitterrific. 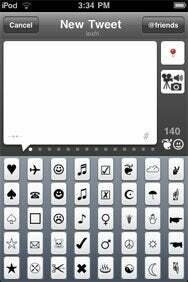 Show Some Emoji: Twittelator Pro gives you access to special Unicode and emoji characters, which can save you space when confining your thoughts to 140 characters. 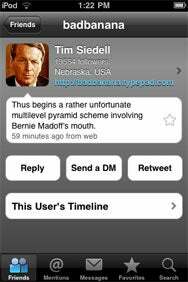 Twittelator Pro is a $5 app from Big Stone Phone. Scrolling is smooth but bizarrely slow. My fastest “finger flick” scrolls no more than four tweets at a time, which is no way to navigate. Twittelator’s cluttered but powerful tweet composing screen allows easy tappable access to special Unicode and emoji characters that are otherwise tough to type, but save tons of space in the 140-character world. Like SimplyTweet, Twittelator is pretty inelegant when switching between multiple accounts (tap More, then un-intuitively tap on your current username, then tap on the new username, and finally tap back on Friends). And, for a change of pace, the app doesn’t only integrate with Instapaper, it can hook into Read It Later as well. It’s also the only Twitter app of this bunch that offers iPhone 3.0-sanctioned features, like the ability to shoot, edit, and tweet video (at least using an iPhone 3GS). Cut and paste works everywhere, with text and images alike; you can paste a photo from another app to post with services like TwitPic. With better support for multiple accounts and some overall design (and scrolling!) refinement, Twittelator could be a real contender. My ideal Twitter client for iPhone doesn’t exist yet. Tweetie’s close, but I’d love for it to include some of the compose screen enhancements from Twitterrific and Twittelator Pro. Still, it’s got the current prime spot on my home screen, though Twitterrific came very close to earning that spot. 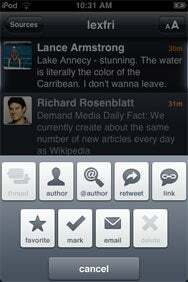 Twitterrific and SimplyTweet are compatible with any iPhone or iPod touch running the iPhone 2.2 software update. Tweetie is compatible with the iPhone 2.1 software update. TwitterFon is compatible with the iPhone 2.x update. Twittelator Pro is compatible with the iPhone 3.0 update.